Boeing has led the way with the blended wing body concept (BWB) that its Phantom Works organization has developed. 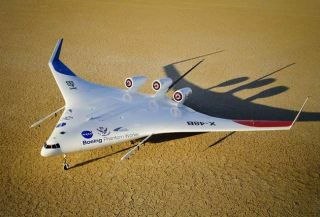 In cooperation with NASA, Boeing flew the X-48B blended wing body scale-model demonstrator for the first time in late July 2007. Commercialaviation could be heading for an image problem. The growingdemand for air travel will require so many additional flights that, despitehuge improvements in the fuel-efficiency of airliner engines, aircraft andflight routings, aviation could account for a significantly higher percentageof global carbon dioxide (CO2) emissions by 2050 than it does now. Last year'sAviation & Environment Summit (A&ES)in Geneva found that aviation accounted for 2 percent of worldwide fossil-fuelCO2 emissions in 2005. But the Intergovernmental Panel on Climate Changeforecast in 1999 that aviation's global CO2 impact would rise to 3 percent by2050. "It's? fairly inconceivable that we can cap emissions at where they are at themoment," said Peter Morrell, an economist at Cranfield University's Department of Air Transport, in England. "The industry is expected to growfaster than any technology that can reduce emissions." Yet in thelast 30 years airliner manufacturers and airlines have made enormous progressin becoming more environmentally friendly. They continue to do so. Forinstance, Lufthansahas reduced the amount of fuel its aircraft burn -- and the amount of CO2 theyemit -- by 70 percent per passenger since the 1970s. In the same period, airlinernoise levels have fallen by 75 percent. Levels of oxides of nitrogen (NOx) fromaircraft engines have fallen 50 percent in the last 15 years. But the aviationindustry considers this just a start. The Advisory Council forAerospace Research in Europe expects airliners in Europe to emit 50 percentless CO2, 80 percent less NOx and 50 percent less noise by 2020 than they didin 2000. NASA has set similar targets for flights in the United States. However, theburgeoning growth of air travel isn?t aviation's only environmental problem.Commercial aircraft fly in the upper atmosphere, and the water-vapor contrailstheir engines produce may create climate change at a rate disproportionate to aviation'soverall greenhouse-gas contribution. "Theeffective and overall impact of aviation on climate change is greaterthan" the 1.6 percent contribution the industry made in 2005 to globalgreenhouse gas, the Society of British Aerospace Companies' Stern Report noted lastOctober. Thisphenomenon is called "radiative forcing," said Morrell. Studies inthe United States suggest that contrails can create 30 percent cirrus-cloudcover on days that are otherwise cloudless. Without a majorchange in aviation operations, radiative forcing could make "aviationemissions account for ? 5 percent of the total warming effect (of all globalCO2 emissions) in 2050," warned the Stern Report. By then, aviation willproduce three times the level of CO2 emissions it does now. TheEuropean Union "has grasped the nettle" by including commercialaviation in a major CO2 emissions-trading scheme, said Morrell. The EuropeanCommission, the EU's policy-making body, plans to cap CO2 emissions for allflights within the EU by 2011. If anairline can't operate within its cap, it will have to buy rights to the excess CO2it creates. "A critical issue," however, is the extent to which the ECcan impose on EU nations and other countries its will to make aviationenvironmentally friendly, said Morrell. TheA&ES reported that 80 percent of aviation's greenhouse gas emissions comefrom passenger flights of more than 900 miles, "for which there is nopractical alternative." So the EC decided that all flights to andfrom EU nations should be CO2-capped by 2012. "Therewas a furious reaction from the U.S.," said Morrell. The U.N. civil aviationgoverning body, ICAO, forbids carbon-pricing programs. The U.S. might get its way. The EU nations' transport ministers won't complete their study ofthe aviation CO2-cap proposal until the end of this year. "It's by nomeans a fait accompli -- it's more likely that it's going to bediluted," said Morrell. Britain and the Netherlands have startedimposing fuel taxes. But both countries are adding these revenues to theirgeneral treasuries and there is no evidence they are using the new levies topromote environmental responsibility. Separately,some airlines are offering voluntary carbon-offsetting plans. These plans ask customersbooking flights on the Web to click on special links that result in thecustomers making donations to environmental programs. Canada's WestJet has done this. TheA&ES concluded that, to become truly environmentally responsible, theaviation industry will need to make progress on a variety of regulatory,technological and operational fronts. Today in Europe, for instance, there are 22 separate air traffic management authorities. Creation ofa unified system would simplify air routes and operating procedures, reducingEuropean airlines' CO2 emissions by as much as 12 percent, said Lufthansa. TheFAA's Next-Generation air traffic system should create similar savings. Fuel cellscould start replacing airliners' auxiliary power units -- small jet engines --soon. More efficient jet engines are being developed and new ducted-fan or unducted-fandesigns, 15 to 20 percent more efficient than today's engines, could enter serviceby 2020. Airlinermanufacturers are using advanced materials to make aircraft lighter and areexperimenting with new, aerodynamicallyefficient body shapes. Aviation companies are exploring alternative jet fuelsources such as biomass waste and liquid natural gas. TheInternational Air Transport Association's goal is to make aviation "agreen industry producing zero emissions" by 2050. By then, concluded theA&ES, hydrogen could be a viable, clean fuel source for aircraft.